We got an official Ghostbusters set from Lego earlier this year so, of course, someone recreated a bit of the movie in plastic block form. It's got some special guest stars, too. 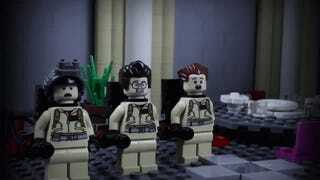 Made as part of the BrickFilm stop-motion animation festival in Canada, this Lego Ghostbusters short is the work of YouTuber MonsieurCaron. You can see the miniature versions of the film's three parapsychologists take on their first case. Here's hoping there's more of this to come.